BURR HAIR CUTS AND STIFF UNIFORMS. Growing up in the 1960's, war was something a few guys in our church went off to and returned from with burr haircuts and stiff uniforms while most of the other guys worked in town or went to college and wore long hair and bell bottom jeans. Vietnam was distant and a source of debate in the few conversations I overheard about it. The wars I could read about and somewhat understand and that the people around me talked about had already been fought--the Revolutionary War, the Civil War, World War I, World War II, and the Korean War. SHEFFIELD SOLDIERS. 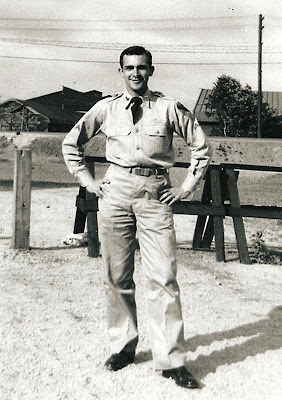 That I know of, I have only two relatives who have been soldiers--Uncle Emery Sheffield served in World War II and Uncle Gene Dale Sheffield (pictured here) served in the Korean War. Neither of my mom's older brothers seemed soldierly; they were overweight, gentle, huggable and fun-loving. How could they possibly have carried guns and grenades and shot at America's enemies, I wondered? Whatever action they had seen was so much of another place and time it seemed to me to be hardly plausible. Only Uncle Emery still lives, but I have never talked to him about his war service. TIGHT-LIPPED ABOUT WAR. But even the homeless Vets of Vietnam and the Persian Gulf War whom I have worked with talk only haltingly about their war experiences. And those who are returning again and again from Iraq and Afghanistan seem to be coming from a different world, leaving it behind and glad to be back. War and battlefield service are not usually the topics of common conversation. The real stories are tucked away, as if locked up, spoken among a few buddies who understand, and kept mostly to a Veteran's self. And so, Ken Burns' efforts notwithstanding, war and Veterans' service remains largely not understood and a mystery, which serves questionable purposes, it seems to me. WE SALUTE YOU TODAY. Regardless, here's to the men and women who have responded either voluntarily or compulsorily to the call of our nation's leaders to take up arms in the defense of freedom across the years and around the world: we honor you today. Great site, and post. I posted a pic on my blog of my dad and me 45 years ago (I was about 3); he was in the Army in Fort Sill, OK (medical residency). Thanks to all the vets!